For non-jailbroken iOS devices apps can only be purchased and installed via Apple’s App Store which opened on July 10, 2008. 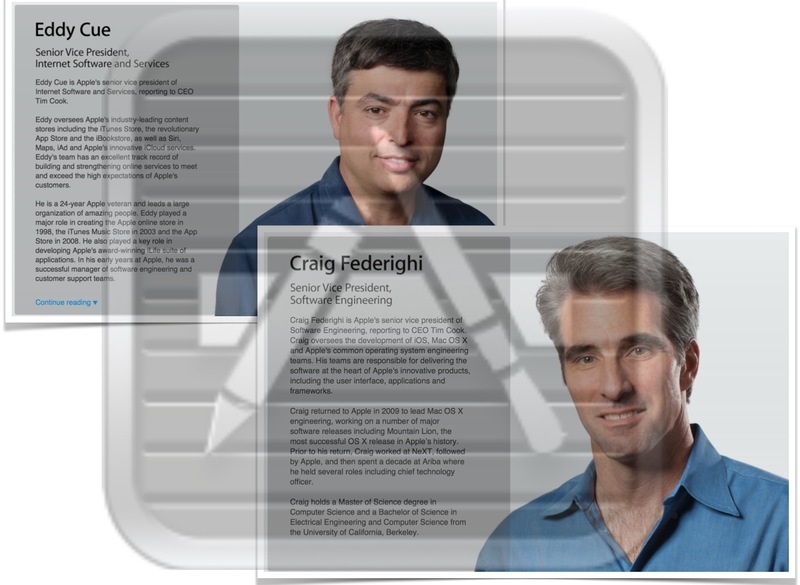 Developers forward their products to Apple where they are reviewed first. After a successful approval test Apple releases the app and users can download it from the App Store. iOS jailbreaking is the process of removing the limitations on Apple devices running the iOS operating system through the use of software and hardware exploits – such devices include the iPhone, iPod touch, iPad, and Apple TV. Jailbreaking permits root access to the iOS operating system, allowing the download of additional applications, extensions, and themes that are unavailable through the official Apple App Store. Jailbreaking is a form of privilege escalation, and the term has been used to describe privilege escalation on devices by other manufacturers as well. The name refers to breaking the device out of its ‘jail’, which is a technical term used in Unix-style systems. A jailbroken iPhone, iPod touch, or iPad running iOS can still use the App Store, iTunes, and other normal functions, such as making telephone calls. Restoring a device with iTunes removes the jailbreak. Registering as a developer (individual or company) costs 99$ per year. You have to fill out all the information necessary for the app – icon, description, pricing, assigning of an app category like ‘Utilities’, etc. Once the forwarded app is approved by Apple and available in the store, you can monitor all the analytics on the back side of it: number of downloads, profit, reviews written by the users, etc. Apple gets a 30% profit sharing for each purchased app. With this strategy Apple’s App Store ranks #1 among all stores for mobile devices. The benefit for Apple is an increase in turnover regarding software and as a consequence even hardware. 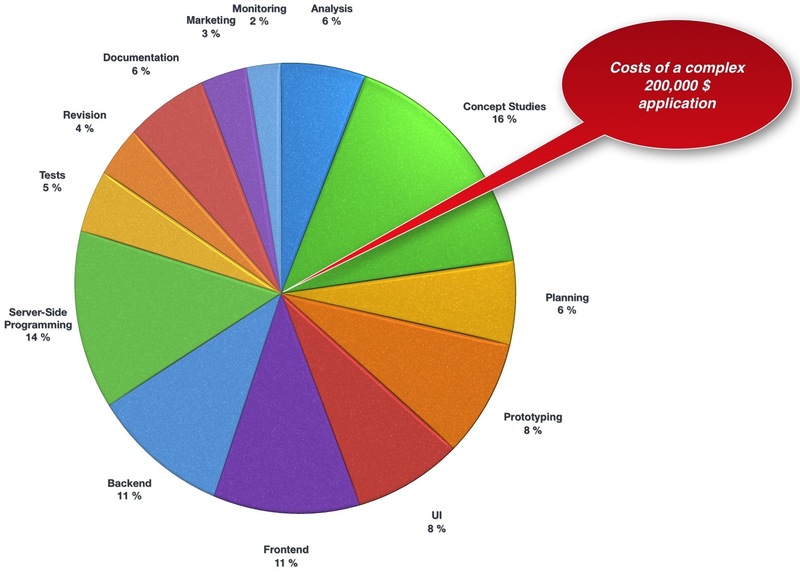 When we talk about costs of app development we should first classify them. This article excludes free apps which are almost designed for promoting services or developed by individuals who just like programming or want to carve out a way to success in getting commissional work. The app allows access to hierarchically organized data. Opening the app displays topics and often a Search-Field where you can enter a term. the app then displays topics matching the term. Tapping on a topic displays related information. This type of app is an extension to simple table-based apps with improved features of parsing out content. Often included is an online access that allows updating of the database to always work with actual data managed on a webserver. A simple solution is to download updated on demand and store them permanently in a local folder of the device. So the user is independent of a working internet connection. A more complex solution is the retrieval of updated records when needed. iOS provides tons of features developers have access to. But some of Apple’s built-in apps don’t meet the requirements of users. With the camera you can take photos of several pages of a document. You will need an additional app to convert these image files into a single PDF, the scanned document. A typical example is Readdle’s app Scanner Pro where scanned documents additionally may be organized in folders. Similar to the database driven apps, these apps are the kind that rely purely on external information – Apps for social networking like Twitter, Weather Pro, WordPress, etc. usually there is Read-Write access to webservers (read tweets for displaying them, write new tweets). Some apps additionally provide encryption when transferring data from or to the device. The user enters the content (writes letters, creates spreadsheets, or presentations, annotates PDFs), manages storage places (local folders and cloud storages), uses convert algorithms (Microsoft Word to Apple Pages) and shares documents with other users. Typical apps of this kind are Apple’s iWork suite, Tap Forms Database, iThoughts Mind Mapping, Adobe Reader, etc. These have the largest range of complexity, starting with something as simple as a PONG type functionality (PONG=one of the earliest video games by Atari) all the way up to a 3D physics engine that does high speed air racing. Scoring points, incorporating the user experience through the physical movement of the device, and hooking into Game Center are all possible. For iOS apps Apple provides it’s programming language xCode. For a short impression look at this video. It explains some lines of programming and the result on the iPhone’s screen. There is no trustworthy stats about the absolute cost of an app based on the above mentioned classification. You will find developers doing everything for $1000 and reliable companies offering complex apps for $500,000. I myself develop complex software for auditors based in Microsoft Access Databases. The experience is: calculating the costs of development is intensely distressing and irritating to the nerves. What you plan is almost always not what you release to the customers. Either features are nice-to-have but go beyond the scope of planned costs or the operating system or external modules don’t support what you have in mind or are buggy, or you are not convinced whether the stability of the system is still guaranteed. Anyway the reality is: Coding is never ready for prime time. This pie chart is based on a survey of app developers in Germany (source AppDevice). For being successful the whole company must have the boundless willingness to develop more reliable and innovative solutions than it’s competitors. Perpetual postgraduate professional education of the staff, risk-taking, and a well-organized, quick-response customer support are the indispensable further requirements. Twitterific, the most popular twitter app in the App Store (€2.69 about $3.50), was solely built with sweat equity. Craig Hockenberry, the man behind Twitterific, recently revealed how much work was required to build the app: about 1,100 hours. At $150/hour, Twitterific for iPad costs about $165,000 for the code only (the iPad app also used existing code valued at roughly $20,000). On top of that, the design phase cost was about $34,000. Finally, project management, testing, and other costs were around $16,000. When you add all these numbers together, the cost to build Twitterific is around $250,000 – note that this app does not even use a backend support system, which would have likely doubled the development costs. As you can see these costs are in no way comparable to the statistical values reported in the survey. As a consequence it’s obvious that all the single steps in the development process strongly depend on the app itself and all the above mentioned influencing factors. Based on my personal experiences within 35 years with Microsoft Access applications the estimated costs for coding and after-release tasks are not down-to-earth. An app that extracts data from a database and displays it in a simple list can be expected to take 4-8 weeks to create at a cost of $25,000 on a single platform. An app with more complex server-side integration and offline data caching will probably take 8-12 weeks and cost $70,000 to develop for two platforms. A full-scale enterprise automation app with integration to business processes will take anything from 3-6 months and may cost over $150,000 to develop on three platforms. The short-term investment in creating those first pristine apps is likely to be the tip of the iceberg in terms of people and capital costs. Whether you’re using internal teams for development or contracting with software companies, you’ll need to make a detailed assessment of the short- and long-term costs of supporting the practice. An app developed today will need to be updated in the future for changing business processes and for operating system updates. It will need to be ported to any new platforms you want to support. According to MGI Research, most mobile apps will experience at least four major update cycles stemming from operating system and device updates in the 2012-2014 time frame. If an app is developed for additional platforms like Android or Windows costs are increased by an average of 25% but the increase of potential buyers is nearly 100%. So it makes sense to develop any mobile app for all leading platforms. It seems to be a good investment when looking on the stats of hardware sales. In the draft version of my article I collected many stats from a wide range of sources. Nearly half a week I compared more than 60 published statistical values which differ from each other massively. Anyway here are some links but it seems to me that the statistical values are hard to validate. Goldman Sachs stated that there is a strong challenge for Google. 70% of purchased smartphones are running with Google’s Android operating system, but 60% of the mobile web traffic is generated by Apple’s iOS users. What are Android users doing with there mobile devices? Are they just making phone calls and play games? Please accept my apologies in advance. But a blog written by an Apple fan is nothing without some sarcastic remarks.